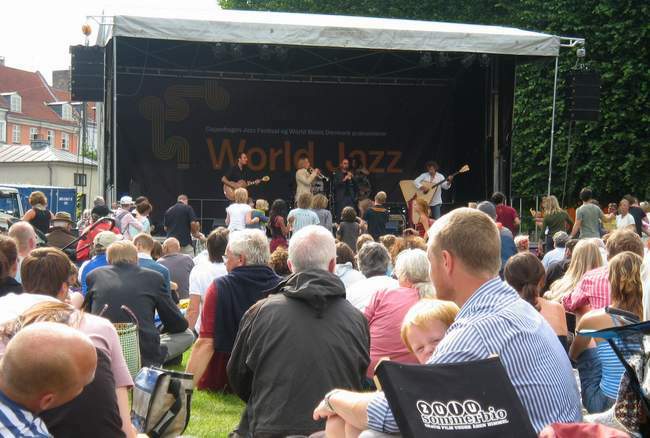 Copenhagen is famous for music: who hasn't heard of The Copenhagen Jazz Festival? Every July famous jazz musicians come from everywhere and play concerts all over the city for a week, most of them gratis. There are other festivals as well, another week-long Blues Festival, Carnival bump-bump-bumps a Samba beat for 3 days, and various rock concerts happen all along. We have a new Opera House, augmenting the old Kongelig Teater (Danish Royal Theater), either of which offers Classical music, Ballet, Opera, if you cater to the top end of musical culture. Tivoli often presents free concerts of International Stars. And of course there are many bars and clubs and discos where you can hear the heavier beat, any kind of music you want. But if I want to separate København from Copenhagen, that is to define the music we who live here go to, I'd better mention that there are some excellent local bands and performers unknown outside of Denmark. And not just because of the language, because the popular music scene here is rather English-oriented. Some bands sing only in Danish, some only in English, but most do some of both. 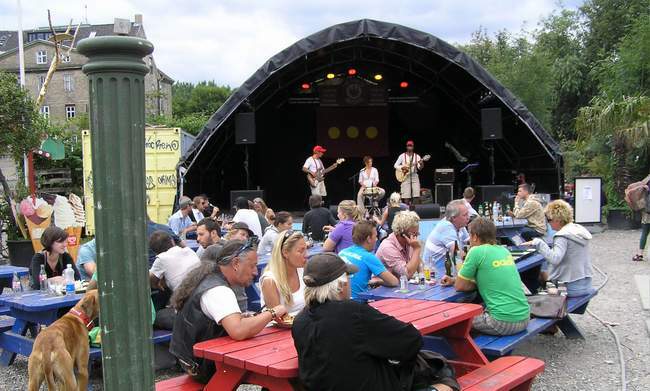 There are lots of concerts, both free and commercial, and some of the names that really draw crowds are Thomas Helmig, Michael Learns to Rock, Shu-bi-dua, Kim Larsen, Henning Stærk, TV2, Gnags, Johnny Madsen, Aqua, etc, and you've probably never heard of them (well, maybe Aqua). An afternoon concert in Fælledparken or Fem-øren is always a big event, and a lot of fun if you happen to be in town anyway. Also in Fælledparken is a domelike structure called Pavillionen, and there is almost always a free concert there in the evenings, out in the open-- or under a tent when the weather's not so good. Recomended if you want to experience a bit of the Real Kbh. 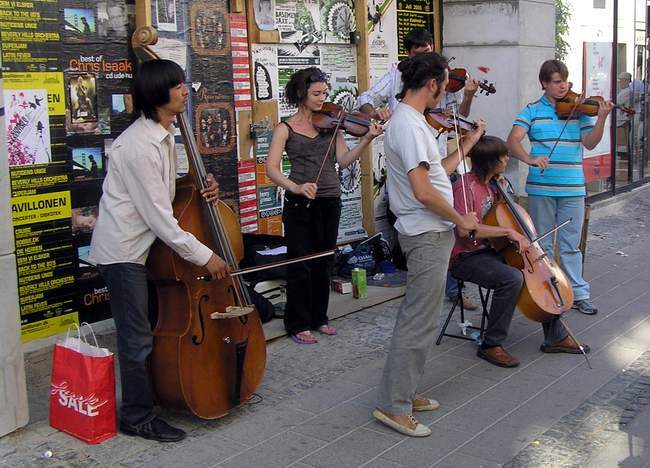 There is a well-established tradition of street musicians and singers playing on Strøget, often students from foreign countries trying to earn a little hat-money as they travel around Europe. Pictured below: typical summer day, Nemoland in Christiania.